Chambers St. Wines in NYC has a real appreciation for Armagnac and picked this single cask of Briat. So let's give it a whirl. There's a lot of honey and ginger on the nose, like a sweet, ginger beer cocktail or maybe a well-made Manhattan. And that's what it tastes like, honey and ginger/lemongrass. 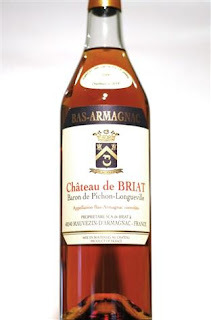 For such a young Armagnac, there's a big dose of wood and that tangy, bitter citrus note that I dig. It verges on being a tad soapy, but it's not a major detraction. Blind, I would have guessed it was much older. Sku (of RecentEats) found the 1995 Briat from K&L to be too bitter, but I'd say that's not the case here. 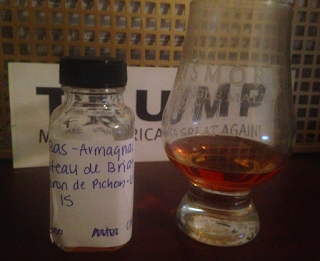 This is a good one for bourbon lovers. Definitely on the sweeter side, but enough spice to balance it out. Easy drinker and a good price. 86 pts, B/B+. Excellent pick by Chambers St. Wines. Available here.